I am Chibuzor (Pronounced Chee-boo-zo). 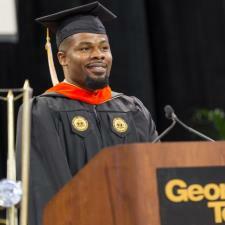 I graduated with both Master and Bachelor of Science in Civil Engineering from Georgia Tech with Highest Honors. As a kid in the middle and high school I started to struggle with Mathematics. It would take a good number of poor grades before I realized what the real problems were; a fear of Math and a class not tailored to inspire courage in the student. One day I met a tutor, and the rest is history. A newfound courage and determination meant that I would graduate high school and all of college with A’s in all Mathematics subjects. Today, as the tutor, it is my personal duty to inspire the courage and knowledge required for you to excel at your Mathematics subjects. My methods include explicit subject introduction using fun real life scenarios as applicable to the student, and hands-on problem solving by the student, under a well-planned tutelage. I have five years of one-on-one tutoring experience. I have tutored middle school, high school and college students. My subject of expertise includes Algebra, Geometry, Trigonometry, Pre-Calculus and Calculus. I enjoy teaching Mathematics, especially seeing a student overjoyed from successfully solving a Math problem. So please join me as we explore the world of Mathematics together.